In 1976 a few members of Chosen Hill Lodge with connections to the Royal Air Force started thinking about forming a lodge based around serving or retired members of the RAF. 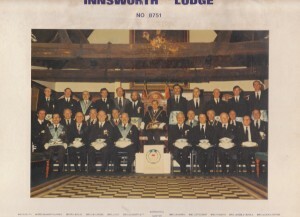 The RAF had maintained a camp at Innsworth since 1940, but no masonic lodge existed to bring together brethren with this common bond. The idea was put to WBro Bluey Neal who was the then Provincial Grand Secretary. He advised that the idea had been proposed on a previous occasion and had been firmly turned down. Being true Military men and not wishing to be deterred by a mere first refusal, a letter was written to the Provincial Grand Master, Sir Knox Cunningham by WBro Geoffrey Shore putting forward a strong case. After much consideration approval was given which resulted in Innsworth Lodge No 8751 being consecrated in February 1977. The lodge still maintains it RAF roots and is currently 1 of only 24 lodges that are part of the Circuit of Service Lodges, however today it has membership which comprises of brethren with either an RAF or Army background as well brethren with no service background. Clay shooting WM assists the presentation of a cheque from National Association of Masonic Clay Shooters to the British Disabled Shooting Group.